Are tolls making a difference for I-66 traffic? Interstate 66 slowed at the height of the morning rush hour this August compared to last, but was faster at other times covered by tolls and HOV rules that expanded last December. WASHINGTON — Interstate 66 slowed at the height of the morning rush hour this August compared to last, but was faster at other times covered by tolls and HOV rules that expanded last December. From 7:30 a.m. to after 9 a.m., an average trip took a few minutes longer than the same time in 2017. Between 6 a.m. and 6:45 a.m., between 3 p.m. and 4:30 p.m., and between 6:30 p.m. and 7 p.m., trips on I-66 inside the Capital Beltway were significantly faster than the year before, Virginia Department of Transportation data showed. Afternoon speeds were slightly faster during the previous HOV-only hours. On U.S. Route 50, U.S. Route 29 and Virginia Route 7, the state said travel times were also generally faster this August compared to last in the peak direction. On the George Washington Parkway, though, traffic was significantly slower this August after 7:30 a.m. southbound and after 6 p.m. northbound. In the afternoon, northbound traffic was faster than the previous year before 6 p.m.
Around 1 in 8 vehicles using I-66 inside the Beltway toward Rosslyn in the morning or toward Fairfax in the afternoon are still using the road without an E-ZPass of any kind. That exposes those drivers to extra fines and fees in addition to whatever the variable toll price is at that time, even if the driver has someone else in the car to comply with HOV requirements. In August, 41.3 percent of all trips on the road at times HOV or toll rules apply were taken with an E-ZPass Flex in HOV mode to indicate that the driver had at least one other person in the car and qualified for a free trip. Motorcycles also ride free. 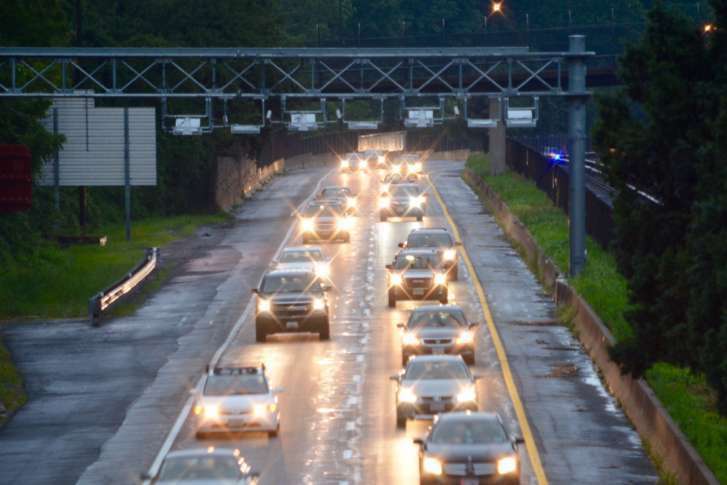 About 46.2 percent of all August trips during tolling hours paid a toll with an E-ZPass. Even drivers who meet HOV requirements are charged a toll if they only have a regular E-ZPass transponder rather than the flex transponder that can be switched between toll-paying mode and HOV mode. Total usage in August was similar to July, with an average of 14,660 morning trips and 17,705 afternoon trips during tolling hours. And, 117 trips out of 744,395 total paid $40 or more for a single trip. The average toll paid in the morning was $6.41, and in the afternoon, it was $4.49 in August. Since tolling began Dec. 4, 2017, the average morning toll per toll-paying trip is $7.94 and the average afternoon price paid is $4.60. Those averages include trips that only use part of the corridor that are charged less than a trip at the same time that uses the entire stretch. The state had promised to examine ways to lower toll prices, but tolls also likely dropped significantly at times in August due to the large numbers of people on vacation or working different hours.